Which are the colleges to study Digital Marketing abroad, or why is Australia ideal for pursuing PHD, or how even to start preparing for those tests to get through? All of those mind-boggling questions churn up students’ heads before applying for higher studies in foreign land. No more worries, because The Chopras is just the place for guiding and preparing you for your future endeavours. “Shaping lives and careers is our core service and students are our core audience. 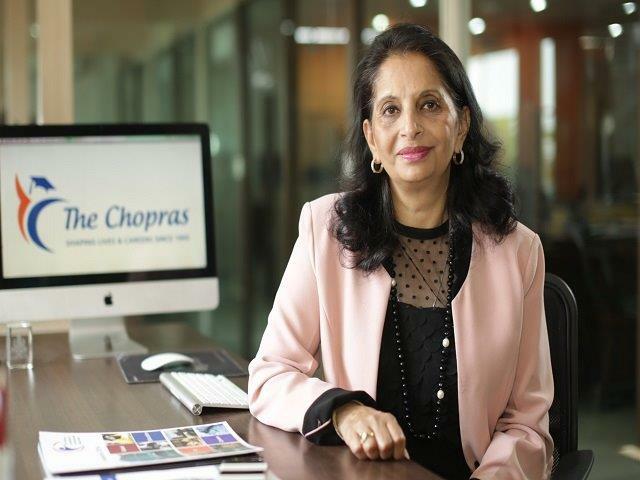 We assist students with planning career pathways leading to further education choices and counseling them with their individual decision matrix and choices for courses and universities”, says Natasha Chopra, Founder, The Chopras. Banking and management consultancy, service excellence, and achievement of client satisfaction have always been at the heart of my professional career. There was no concept of forward career planning in the context of a fast changing world and we talked up a storm such that today almost all schools have Career Counselling cells. The industry was unfortunately peopled by unethical players. Our approach benchmarked it. Enthralling, exhilarating, full of learnings and fun! We have alliances with 500 Universities globally and many partners in the education and associated industries. I see the future of The Chopras as becoming a true education multinational. We plan on setting up our first university, The University of North West Himalayas (UNWH) in Uttrakhand. We even plan on setting up K-12 schools, institutions conceived in the 21st century for the 22nd century! When you are thanked and blessed by parents and students for showing the right path. An unbelievable high! We are fortunate as a large numbers of universities in our portfolio approached us on the wings of our reputation.